In 2011, the production rate of broilers was 8.6 billion with a value of $23.2 billion (USDA 2012). Both CERCLA and EPCRA have reporting requirements for ammonia (NH3) of 100 lb of NH3/d or 18.3 tons/yr, a level that may affect large animal production facilities (NRC 2003). Although USEPA (2009) has provided an exemption for animal waste producing farms under CERCLA for reporting hazardous air emissions, it is expected that this exemption will be revoked once valid methodologies are established for monitoring. Two of the 24 sites in the NAEMS monitoring study reported similar NH3 emissions of 3.6 – 5.3 tons of NH3 per house per year (Burns et al. 2009, Heber 2010). Emissions of this level indicate a need for developing technologies that can reduce the NH3 levels produced by broiler operations. This research is focused on the use of broiler litter as activated carbon (BAC) to reduce aerial NH3 generated by litter, an opportunity to not only reuse the manure, but also treat the emissions from or within broiler houses. The objective of this study was to evaluate the efficacy of BAC to remove NH3 volatilized from litter samples in a laboratory acid-trap system. Preliminary studies using NH3/air mixture indicated that the BAC capacity to adsorb NH3 was approximately double that of Vapure 612, a commercial carbon. In the litter emission study, the BAC and Vapure performance was comparable. Breakthrough for both carbons occurred within 14 hours of the test start. At the end of the 3 day test, the NH3 emission for BAC was 75% of the litter only control, whereas, the Vapure emission was 64% of the control. The results of the study demonstrate the potential for a cyclical waste utilization strategy in using broiler litter activated carbon to capture NH3 volatilized from litter. Why Study Ammonia and Poultry Litter? Overall purpose of this study is to develop innovative solutions for animal waste reuse and minimize emissions from poultry operations. The specific objective of this phase of the study was to evaluate the efficacy of activated carbon from broiler litter (BAC) to remove NH3 volatilized from litter samples in a laboratory acid-trap system. The broiler litter for producing the BAC was obtained from a commercial farm in Mississippi, where the original bedding was pine shavings. The broiler litter as collected had a moisture content of 25 to 30%. The commercial carbon, Vapure 612 carbon (Norit Americas, Marshall, Texas), is a steam activated coal-based carbon manufactured for use in the removal of odors, toxic vapors, irritants, and corrosive gases. After completing initial adsorption tests with the two carbons using the NH3 and air mixture, litter samples were collected from a commercial Mississippi farm where the bedding origin was also pine shavings to perform the litter emission test. Eleven flocks had previously been grown on the litter. The pH and moisture content were 8.32 and 17.9% respectively. The litter samples were placed in the acid trap system described below to determine the capture capacity of the carbons for NH3 volatilized from the litter. Litter emissions and carbon efficacy were evaluated using 50 g fresh litter samples in the laboratory using a chamber acid trap (CAT) system. The CAT system provides a straightforward method for determining differences in NH3 evolution by capturing off-gases in H3BO3. Twelve air-tight chambers, 1000 ml each, receive humidified air from a single manifold. Weighed litter samples were placed in each air tight chamber. To assess litter NH3 generation, exhaust air from each chamber flowed through a series of two H3BO3 flasks at approximately 115 ml/min. The solution from the two flasks was combined into a single sample and titrated with HCl as above. The NH3 trapped in solution was reported as mg N recovered. For estimating carbon column efficiency, the columns described above were loaded with BAC and Vapure carbons and placed in the exhaust flow between the chambers and acid traps. The litter only, BAC and Vapure columns were randomly assigned to the chambers in the CAT system and each replicated three times. All treatments were titrated each morning and afternoon at consistent times for the three day test period. 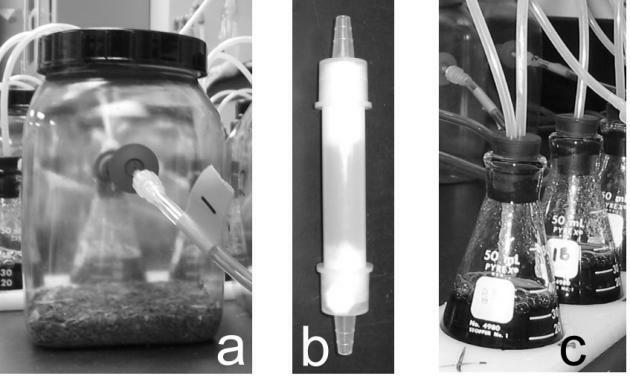 Chamber acid-trap system for capturing NH3 in the laboratory: a) litter in chamber, b) activated carbon column, and c) boric acid traps. Preliminary studies using NH3/air mixture indicated that the BAC capacity to adsorb NH3 was approximately double that of Vapure 612, a commercial carbon. In the litter emission study, the BAC and Vapure performance was comparable. Breakthrough for both carbons occurred within 14 hours of the test start. At the end of the 3 day test, the NH3 emission for BAC was 75% of the litter only control, whereas, the Vapure emission was 64% of the control. The results of the study demonstrate the potential for a cyclical waste utilization strategy in using broiler litter activated carbon to capture NH3 volatilized from litter. The development of these activated carbons and char from broiler litter will provide an effective means of reuse that will not only reduce waste volume, but in turn comprehensively treat the emissions from the waste during bird production, storage, and land application of litter. We will conduct greenhouse gas adsorption studies to determine the efficacy of activated carbon and char to adsorb CO2, CH4, and N2O. Additionally, our plan is to develop an outreach program to be presented to poultry farmers in the Southeast U.S. along with other stakeholders addressing poultry farm emission regulations and technologies for remediation through workshops, a webinar and professional conferences. Previous PostPrevious What Practices Increase Infiltration and Reduce Runoff on Slopes Greater Than 30%?